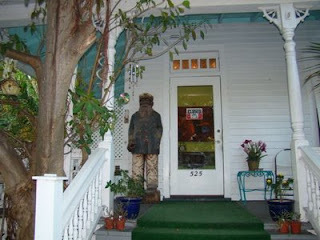 We have a sentry on duty on the porch of our Real Key West Gallery on Caroline St. The figure of a ship's captain is about five and a half feet tall -- or six-three standing on his nine inch base. (Click on photo for larger size). The carving came originally from the Oak Beach Inn in Babylon, NY, then the Oak Beach Inn Key West that was here for about a year in the early 2000's. The Captain had a mate, a female dressed in period garb, but she was sold a few months ago. The captain piece is also for sale. Negotiate with its owner directly. E-mail us or call us at (305) 304-1565 if interested. More photos available at our Picasa site. Several people have noted a resemblance to the late Captain Outrageous. Janet and I had to get used to seeing someone standing outside the door when we opened it on the first few days after the carving arrived. Now we'll miss it when its gone.